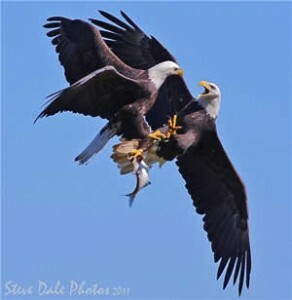 The bald eagle population along the James River in Virginia, throughout the broader Chesapeake Bay and within many areas elsewhere in the species range has grown dramatically since the DDT lows of the 1970s. The population within the Chesapeake Bay is rapidly moving toward saturation where most of the appropriate habitat will be occupied. Once the population reaches saturation, younger age classes that are reaching sexual maturity have no space to form new territories. These birds will float from territory to territory searching for openings within the breeding community that they may fill or alternatively may challenge territory holders for their space. In the early period following saturation the number of “floaters” in the population vying for space may reach several times the number of actual breeders placing intense pressure on birds for territory defense. Combat wounds and deaths are becoming increasingly common as these conflicts escalate in the Chesapeake Bay. These wounds are signs of generational conflicts. Through a reduction in productivity and an increase in mortality, these conflicts will ultimately bring the population into balance with available space. The Richmond pair was included with a group of 16 other pairs along the James River that were under video surveillance as part of a graduate student project under the direction of Dr. Bryan Watts. The project was designed to investigate the behavioral interactions between resident pairs and intruders around active nests. We are interested in quantifying intrusion rates and how these intrusion events influence nesting ecology. The study used a combination of direct field observation, cameras mounted on nests (nest cams) to record adult behavior, and cameras placed distant from nests (intrusion cams) to see activity around the nest. The Richmond pair moved to a nearby island for the 2013 breeding season and it is not feasible for CCB broadcast video from the new nest. Nest cameras are very effective tools for investigating questions that involve infrequent events and species that are sensitive to human disturbance. 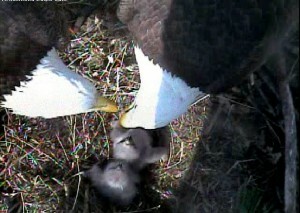 The Center for Conservation Biology has used video surveillance to study the nesting ecology of several species including bald eagles, peregrine falcons, osprey, and American oystercatchers. Over the past decade, we have effectively recorded more than 20,000 hours of footage of these species and answered dozens of questions. 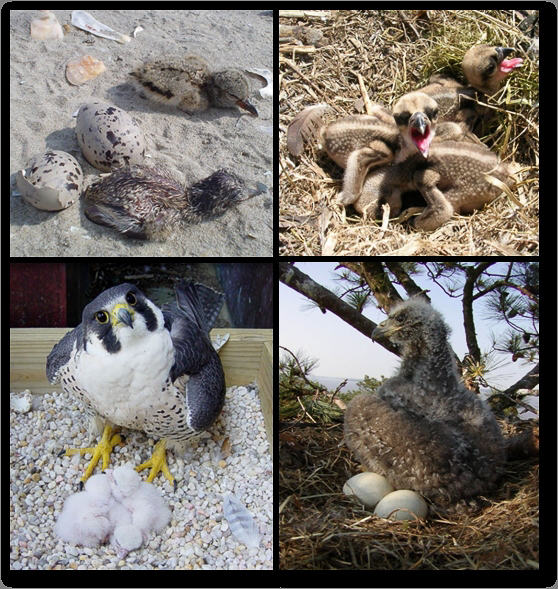 Video projects have been completed on American Oystercatchers, Ospreys, Bald Eagles, and Peregrine Falcons (clockwise from top left).